How to burn videos to DVD, or how to burn DVD to ISO or DVD folder? No worries. 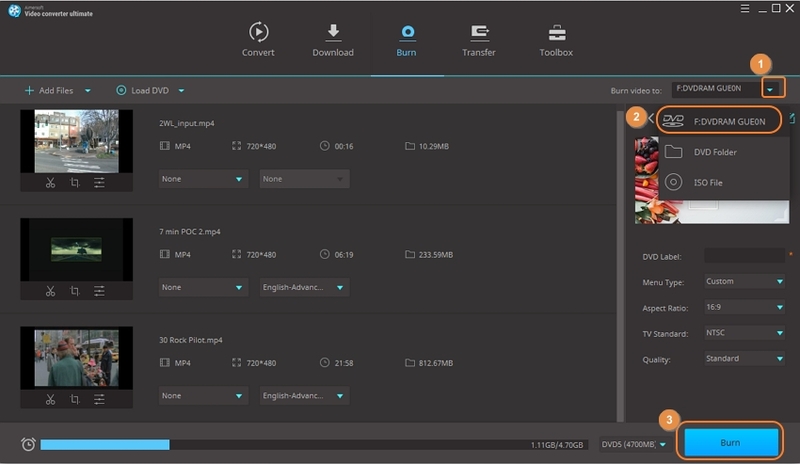 Aimersoft Video Converter Ultimate can help you do all of them. The following guide will show you how to burn video to DVD easily, and how to burn DVD to ISO step by step. Moreover, you can burn high resolution videos to Blu-ray disc as well on Windows PC (Not available on Mac currently). Install and open Aimersoft Video Converter Ultimate on your Windows PC or Mac, then switch to the Burn tab. 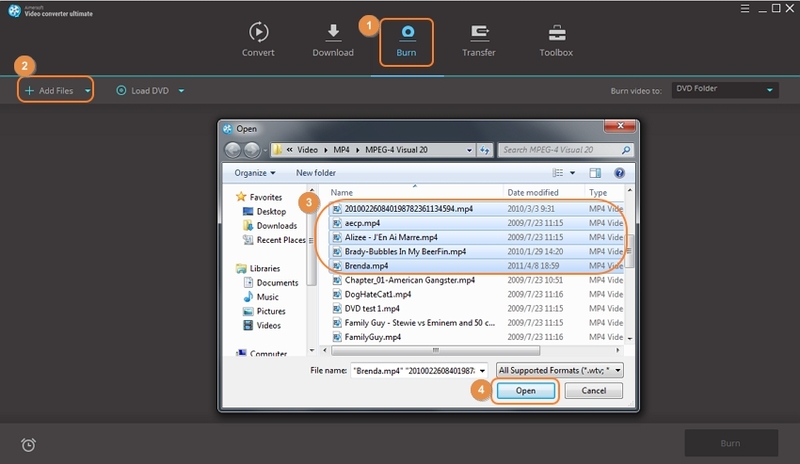 Click the +Add Files option to choose the videos that you want to burn to DVD. Click on the Open button to load the videos. 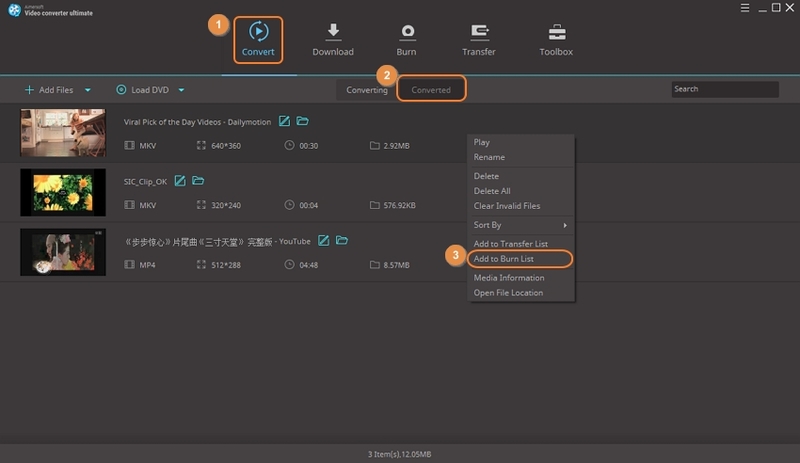 Optional: You can import the videos that you have converted or downloaded in Aimersoft Video Converter Ultimate. On the Converted tab from the Convert section, or on the Finished tab from the Download section, right-click on the target videos and choose the Add to Burn List option. 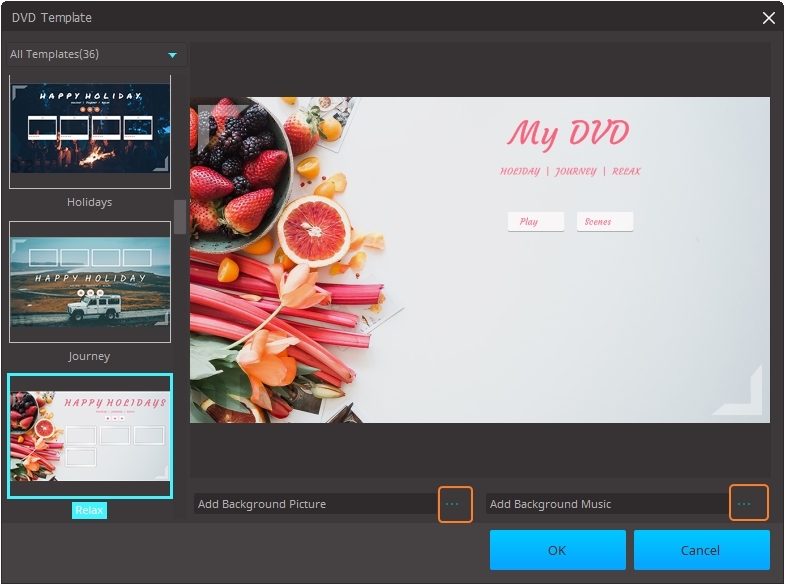 After loading your videos, now you can choose a template for the DVD. From the right side of the interface, preview and select your favorite template by clicking the left or right arrow. Click the Edit icon, you can view more templates. When you click the Edit icon, there will pop- up a new window where you can add the background picture and the music for the DVD. Now back to the main interface, you can adjust the parameters for the DVD, including DVD label, menu type, aspect ratio, TV standard, and quality. When everything is set, it’s time to start burning videos to DVD. Insert a DVD disc to the computer, and choose your DVD from the Burn video to: option. 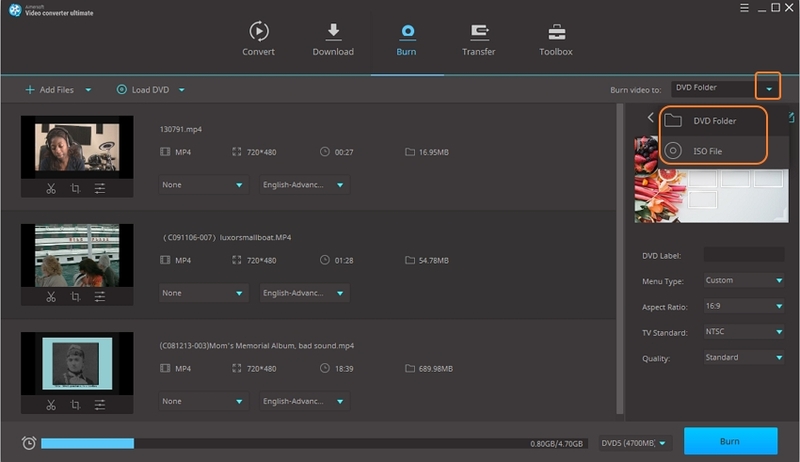 Finally, click on the Burn button to burn videos to Blu-ray disc (Windows only). If you don't have a disc around, you can burn videos to DVD Folder or ISO File. To burn DVD to ISO or DVD Folder, firstly please insert a DVD disc to your computer. 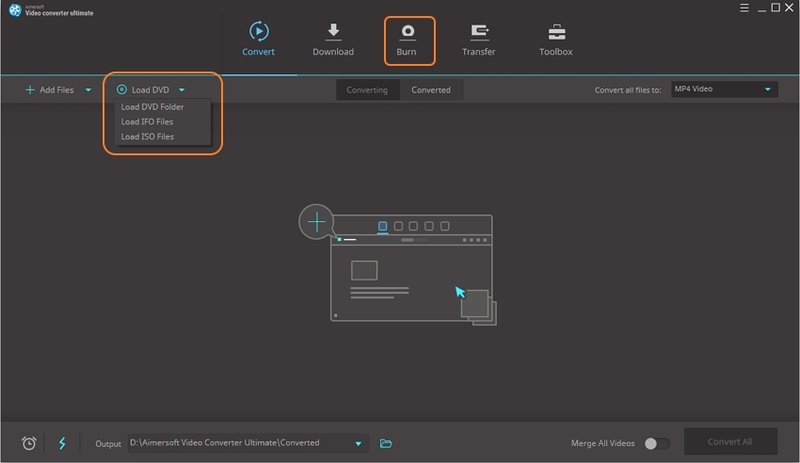 Run Aimersoft Video Converter Ultimate and go to the Burn tab. Click the Load DVD option. Now choose the files from DVD to be loaded to the DVD burning software. The last step is to select the file type into which you want to burn. Go for the Burn video to: option, and select ISO or DVD Folder from the drop-down box. Finally, click on the Burn button. 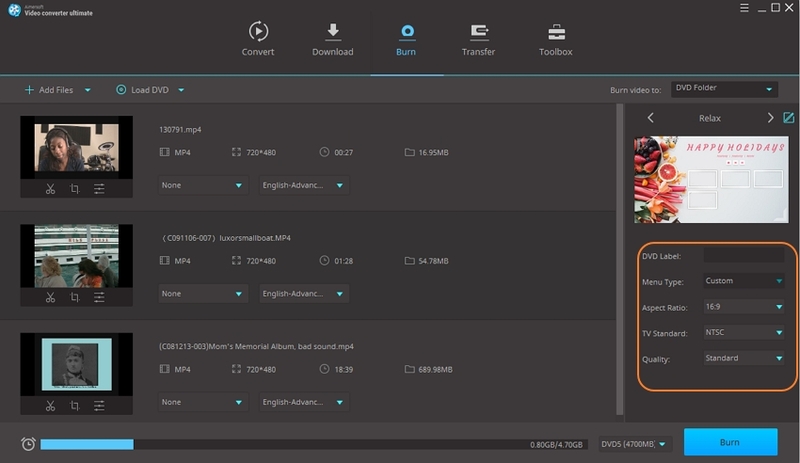 You can also burn ISO file to DVD in the same way.